We’re pleased to offer the third installment of our Spotlight series to highlight MPHA partners across the state who are changing lives and communities to improve health and advance health equity. Our previous spotlights were on Partners for a Healthier Community in Springfield and the Worcester Food & Active Living Policy Council. This month we interviewed Kerrie D’Entremont, Executive Director of the Greater Lowell Health Alliance. MPHA: As a Lowell native, what’s something you wish more people knew about the city? GLHA: Lowell is a city infused with an incredible spirit of collaboration and cooperation. This is a city that has had to reinvent itself over and over, first to recover from the decline of the textile industry in the early 20th century and again through the boom and bust cycles in the second half of the century. But again and again, while many other post-industrial cities have struggled, Lowell has experienced an entrepreneurial and cultural renaissance, developing a long-lasting strategy for reinventing itself through partnerships and an extraordinary spirit of collaboration. The result is a great city for people to live, work, and visit. MPHA: How and why did the Greater Lowell Health Alliance come to be? GLHA: The “Greater Lowell Health Alliance of the Community Health Network Area 10” was founded in 2006 with a goal to address unmet health needs and improve the overall health of the Greater Lowell communities. GLHA is comprised of healthcare providers, business leaders, educators, and community leaders with a common goal to help the Greater Lowell community identify and address its health and wellness priorities. In 2008, GLHA merged with Community Health Network Area #10 (“CHNA 10”). Bringing together GLHA and the CHNA has strengthened our ability to work with others in order to enrich the region, network and share ideas, gain knowledge about health-related issues and topics, and increase cultural competency of the services provided in Greater Lowell. MPHA: How does GLHA help the region achieve continuous improvement in health status? GLHA: We collaborate with more than 120 community partners to help individuals and organizations improve the health of the region. We raise awareness and provide resources for community organizations, schools, healthcare providers, and civic and business leaders. An essential part of our work is to identify and address the health disparities in the community. In 2013, GLHA partnered with Lowell General Hospital to commission students and researchers at UMass-Lowell to conduct a community health needs assessment to identify the unmet medical and public health needs within the Greater Lowell community. This needs assessment validated that we’re on track in targeting the areas most in need. MPHA: What are the public health areas of most need in Greater Lowell? GLHA: The 2013 assessment identified mental health, substance abuse, diabetes, obesity, respiratory diseases (asthma and chronic obstructive pulmonary disease), cardiovascular disease, and the rates of Hepatitis B within the Cambodian community as areas in need of the most public health attention. It also identified the populations at greatest risk for these issues: the elderly, immigrants, non-immigrant Latinos, youth, low-income individuals, those with mental health issues, and the GBLTQ community. The full assessment is available online. MPHA: How is GLHA structured to do its work? GLHA: As a “collaborative coalition,” GLHA relies almost entirely on public commitment and volunteerism. We have a board of directors as well as five task forces: (1) Substance Use and Prevention, (2) Cultural Competence, (3) Healthy Eating and Living, (4) Maternal Child Health, and (5) Mental Health. All of these task forces are comprised entirely of community volunteers who take time from their full-time commitments to focus on the health of others. The creativity and resiliency of these task forces have already led to significant improvements in our healthcare landscape and have set the stage for long-term improvements in the health of our community, with a focus on encouraging collaboration among member organizations. MPHA: Tell us about the goals of GLHA’s Community Health Incentives grant program. GLHA: Over the next 14 years, the GLHA will receive nearly $5 million ($350,000 per year) from Lowell General Hospital through the hospital’s Determination of Needs (DoN) process for its recent campus expansion. This process through MDPH ensures that hospitals are providing a measurable benefit to the communities they serve. These funds will support GLHA in taking the lead on addressing many of the needs raised, helping organizations target priority areas of attention as identified by the needs assessment and the GLHA task forces. MPHA: What’s one change you hope to see in the city as a result of the grants? GLHA: We hope to see critically important front-line organizations in our communities better equipped to tackle these priority areas, generating a measurable impact on the reduction of unmet health needs for our residents. 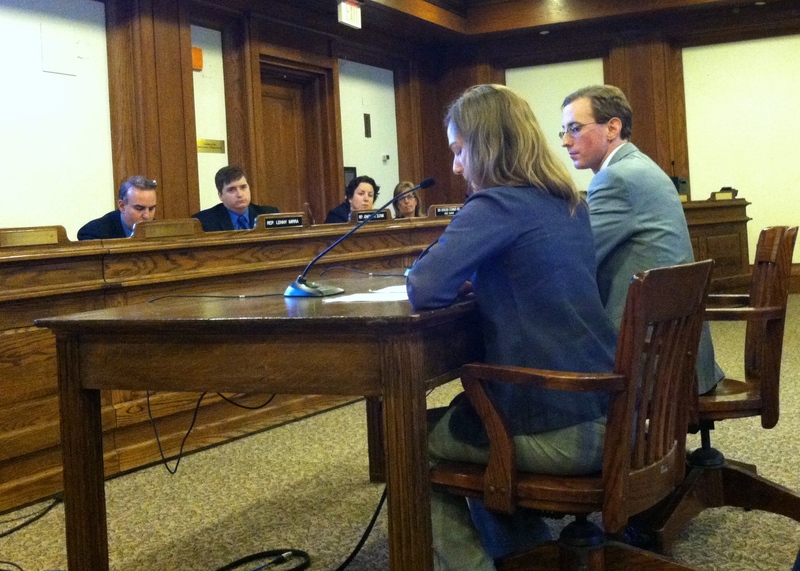 Francey Hart Slater from Mill City Grows (left) testifying alongside Maddie Ribble from MPHA (right). Along with Kerrie, Francey is a key liaison for GLHA & MPHA .